Have you ever wondered how your life would have been if you’d been born somewhere else? Do the same things that matter to you matter to someone else the other side of the world? 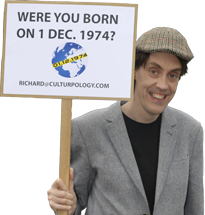 I’m Richard Avis, an Englishman meeting people around the world born on exactly the same day as me – 1st December 1974. I am looking to meet Time Twins from as many cultural backgrounds as possible. The project is about exploring how people’s circumstances, locations and heritages impact upon their lives. The aim is not to compare life against life, but to develop a clearer understanding of what matters to people of different ways of life around the world. We talk about their way of life, their achievements, their goals, the challenges they face and their views on success and happiness. The Time Twins are witnesses to their cultural environment and the meetings provide a unique record of life across the world.